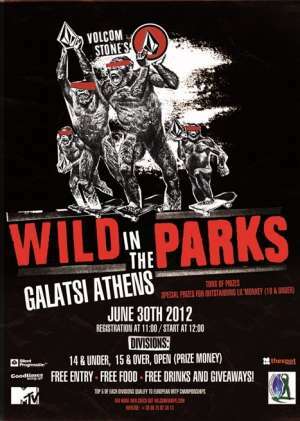 For it’s 9th season in Europe, Volcom Stone’s Wild In The Parks 2012 kicked off in June and is stopping in 15 locations this spring and summer from Portugal to Finland, covering almost every European country. There are 3 divisions to choose from: an Open division with cash prizes, a 14 and under and a 15 and over categories, and as every season, these contests are entirely free, with free entry, free food, free drinks and tons of prizes! This year, the top 5 of each category at each contest will qualify to the European WITP Championships on the 6th of October in Spain (location TBC), with a 6000€ prize purse, a spot to compete at the 2013 Amsterdamn Am and million more prizes to win. The European WITP Championships is an outstanding event that gathers skaters from so many different areas but also puts together some of the top European skaters with local heroes and up and coming talents who are entering their first “international competition”.